Teenage Fashion 2019. “Style is a way to say who you are without having to speak.” —Rachel Zoe. Being a teenage girl is hard enough without having to worry about what to put on your changing body. Plus, in an ever-changing industry, it’s hard to figure out what actually works for you and best suits you and your personality. So here at Outfit Trends, we have made it easy for you. We have compiled 18 outfits along with the best tips and tricks to help you create looks that will enhance your natural beauty and make staying fashionable as easy as flicking through your favorite shows on Netflix. What To Wear For Teenage Girls? Featuring a variety of trendy looks, we have also sampled for you some classic outfits that will always be stylish regardless of the latest trend. You can pick and choose according to what fits you best. Feel free to mix and match as well! Once you figure out the type of style that matches your personality you can get creative and play it up a bit! Fashion is a journey that you have only just begun. Without further ado, here are our best 23 outfits for teenage girls plus fashion tips! Go back to school in a cool and floral bomber jacket outfit. For more ideas, here are 25 Cute Back To School Outfit Ideas For Flawless Look. This look is so easy to put together and you can wear it any day of the week! Pick a three-quarter length sleeved top of your choice. The one pictured is white with pale pink sleeves and a pale pink collar. Pale, neutral tones are super stylish, especially when paired with another fabric/color of your choice. Here this black, corduroy overall dress hits mid-thigh (you might need to go a bit longer depending on your school’s dress code) and features adorable buttons and classic overall clasps. With this look, you do not need many accessories. Some simple stud earrings will do the trick along with a ring or two. Choose a neutral-coloured backpack like this gray one. It will match almost everything. Finish off the look with a pair of black and white sneakers (pictured are Vans) and tie up your hair in a sweet half-up, half-down do. This is a cute and versatile look that works for just about any casual occasion! 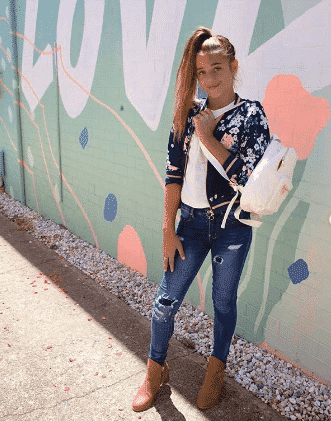 Here are some more Sporty Style Outfits for School Every Girl Must Try. Here’s another similar look but with a different colour tone. Denim skirts really came into their own in the good ol’ nineties. Before that, denim pencil skirts were The Thing. Now, they’re back and they are better than ever (i.e. this is how you wear a jean skirt a la modern fashion). This cute little wardrobe piece hits mid-thigh, is high-waist, and features a line up of buttons down the front. It is very form flattering, especially when worn with a tucked in top. This tee features a high collar and a beautiful flowery print with sleeves that are just a bit on the long side. You can accessorize with a variety of rings on your fingers and the earrings of your choice. (Small hoop earrings or stud earrings would suit this look very well.) Pull your hair back in a loose half-up, half-down hairstyle, and leave a few wisps loose to frame your face. Tuck in a pair of sunglasses to pop on once you’re out and about! A shoulder purse with a big clasp or buckle can be super stylish. Throw on a pair of slipper style shoes: these are deep red and feature silvery studs along the heel – perfectly matching your buttoned skirt – and echo the reddish pops of color in the shirt. Adorable and stylish, this is a perfect look for a day at the mall or lunch out with your best girlfriends! Don’t miss out these 20 Outfit Ideas For Teen Girls In Summer. If you ever watched Friends and thought, “Man, I love those ’90s looks,” then this is the outfit for you. With this ensemble, you’ll be wearing a black and white striped knit sweater tucked into a pair of slightly baggy skinny jeans. With this look, you’ll want to go for a fitted sweater so as not to overwhelm your frame. A traditionally sized black, silver-clasped belt is the perfect throwback accessory. Black, shiny dress shoes lend a bit of a tomboyish vibe as well. Tease your hair a little and tie up in a half-knot on top of your head. Some round, Harry-Potter-esque eyeglasses are the perfect touch to finish off this great school day look. Spotted! A Gossip Girl approved ensemble with a trendy twist. With this outfit, you’ll be donning a cute gray dress featuring thin, spaghetti straps and a straight cut neckline over a black turtleneck sweater. Very stylish, much fashion. You will also be wearing a pair of sheer black tights and the trend-setting piece of choice: these black and white high-tops. With footwear this comfortable, you will never want to take this outfit off. To complete the look, straighten your hair and wear some simple stud earrings. Voila! Next time you’re on family vacation consider taking this little look out for a day on the town. Here at Outfit Trends we want to show you that every clothing piece has endless potential. In this case, we feature again this very modern, very stylish denim skirt which can obviously be worn in a variety of ways. With this look, you’ll again be tucking your favorite blouse or top into your skirt (you want to get the maximum benefit of all those cute buttons!). This particular tee is a soft pink and has a cutesy pattern you could easily replicate or replace, depending on your own personal sense of style, and has mid-length sleeves folded over at the elbow. The shoe of choice is a cute white sneaker, which is such a great wardrobe essential and can be worn a variety of ways. A simple, small black purse (another staple, in our opinion!) completes the look. This burnt orange top and brown knit beanie is everything we could ask for in an everyday look that is as trendy as it is stylish! For an indoor winter look or an outdoor autumn look, this outfit is perfect for nearly every occasion. This bell-sleeved top is loose and flowy (and super forgiving if you do not feel like wearing a form-fitting outfit) and pairs really well with black skinny jeans that hit just above the ankle. The choice of footwear is fun and unexpected (and honestly, most shoes would work with this outfit) and helps bring a more everyday appeal to this otherwise autumnal ensemble. Throw on a beanie and your favorite eyeglasses and you’ll find yourself looking equal parts trendy, stylish, tomboyish, and chic! For a look that straddles two ends of the spectrum, check out this casual ensemble that features a white ruffled crop top, army green ripped trousers, and a pair of trendy white sneaks. This outfit is super trendy and is great for a day out with your friends. For a good and fresh outfit that is definitely Emma Chamberlain approved, check out this trendy look featuring a mustard yellow beanie, a black turtleneck tucked into high-waist checkered trousers, and a pair of standout black Doc Martens boots. This is a fashion-forward look that has been very a la mode, especially among Instagram’s finest, so if this is an ensemble that speaks to you, why not go ahead and try it out. A simple silver necklace is the only accessory you’ll need. Everybody talks about having a Little Black Dress, but how about a Little White one? This lacy number is sweet, but when paired with these patterned sneakers you get a look that’s both playful and fun! Perfect for a summer party or a day at the mall. Here are Top 70 Fall Outfits for Teen Girls to Copy This Year. Here is our third option for this style denim skirt. Wear over sheer black tights and tuck in a simple white long-sleeved top. A choker really goes well with the tights and black ankle boots. Let down your hair and throw on a little purse and voila! If you love a comfortable, casual look that still looks put together and stylish, look no further. This outfit is so easy to pull together and is endlessly doable. Start with your favorite pullover hoodie. Any color will do but grey and denim tend to look really good together. Then add a denim jacket. You can fold over the cuffs at the wrist and let your hoodie sleeves peep out. You’ll want a jacket that isn’t too fitted but not over-sized either. Next throw on a pair of black leggings. They balance the extra fabric you have up top. Now is your choice of footwear. These bright orange high-top Converse are comfy, cute, and will never go out of style, but if you like a more understated look, go for something a little more muted, like a white sneaker. Last but not least, tie up your hair in a top knot and throw on your favorite cross-body purse. And there you have it! Comfy, casual, cute. We love it. Now this is a chic look if we ever did see one. This ensemble is made up of several different pieces that you wouldn’t think could work together and yet they totally do. Start with the top. A white tee is folded at the sleeves and tucked into a pair of beige high-water trousers. Footwear is your choice of trendy sneaker (you want some height and some distinction to really have them stand out). Last but not least is a gold clasped purse. This is a great outfit for walking around the city or grabbing coffee at your favorite cafe. We have already established that a little white dress can be just as stylish and wardrobe-approved as a little black one. So here’s another look to prove it! This is a sweet and youthful look that is easy to put together. A white fedora hat is paired with a trendy pair of colored aviator sunglasses. This white dress has a lacy scalloped hem and a high neckline. Your accessories would be a small cross-body purse and watch. And there you go! We’ve all been there. It’s Saturday morning and you’re rushing out the door, on your way out to hit the mall with the girls. You want to be comfortable but still look cute. So what do you do?! Throw on your favorite pullover hoodie and leggings, that’s what! And let your shoes and bag do the talking. Get a little bold with a black tasseled tote and some standout black ankle boots. Keep your accessories minimal and let your hair down. Done! For an alternately casual look that does well when you’re hitting a new city or traveling, check out this cute ensemble! All you need is a white tee and some overalls. If you love a hat, throw that on, too! You can keep your accessories minimal with some aviator sunglasses and a cross-body purse. Some flats or little sneakers are comfy and great for walking in. Now go explore! Here are 10 Best Prom Outfit Ideas for Teen Girls 2019. Most of us have these clothing items in our wardrobe already so if you’re in a pinch, this is the one you’ll want to try! Toss on a cute little tee and tuck the front into your jeans. Rolled cuffs instantly make you look more put together, especially when paired with these cute sandals. Let your purse be the standout feature of this outfit, along with your ballerina bun. This outfit is great for running errands or babysitting your neighbor’s kids! Most of these outfits can work year-round, but this is a look exclusively meant for those cold snowy days when you want to get outside but still look stylish. This is a versatile and super cute look that is fun and youthful. Grab a white turtleneck sweater and your favorite pair of jeans. Rolled hems are once again what makes the look work. Your choice of footwear, whether high-tops, Converse, or Nike – it’s up to you! A plush teddy coat and beanie makes you both warm and cute. Plait your hair into braids and voila! You are winter approved and fabulous. ↓1. Same Shoes, Different Look! For our final look, we have turned to the endless inspiration that this Insta girl provides and chosen this very current, very trendy ensemble. With this look, you’ll be wearing a long open cardigan over a tucked in gray tee and light wash, ripped blue jeans. This is an understated look so loose braids and your favorite pair of eyeglasses are the accessories of choice. This outfit is great for lunch at your favorite cafe!